Wireless InSite’s Communication Systems Analyzer is a set of post-processing routines that builds on the X3D model’s high-fidelity MIMO calculations to predict system throughput and bit error rate. This example utilizes these routines to analyze throughput between three small-cell base stations employing Full Dimension (FD) MIMO beamforming to User Equipment (UE) moving along a route, using 5G New Radio (NR) in a dense urban environment. The building and foliage geometry was imported from a high resolution shapefile of geometry for a section of downtown Boston, MA. The imported city model, foliage, and the terrain contain a total of 6,452 faces. The buildings and terrain are assigned concrete material properties with conductivity of 0.484 S/m and permittivity of 5.31 taken from ITU data for concrete at 28 GHz , , while foliage is modeled using a foliage penetration loss model by Weissberger . Figure 1: Isometric and overhead view of project geometry in Wireless InSite. Each transmitter represents a base station and uses an 8x8 dual polarized patch array consisting of a total of 128 elements. Cross-polarized isotropic antennas are used at receiver locations along the route. Wireless InSite’s GPU-accelerated X3D model was used to provide high fidelity propagation results which include reflections from the buildings and terrain and diffractions from building edges. The combination of high resolution geometry and high fidelity propagation modeling is necessary to achieve accurate results at 5G NR frequencies. The propagation model calculates the H-matrix from each element of the three transmitters to the receiver locations (128 x 2 = 256 entries per tx-rx pair). In this example, a communication system is defined, specifying analysis of throughput between three base stations and a UE traveling along a mobile route. The communication system properties window defines a custom beamforming table for the base stations, the use of selection combining by the UE, and a custom throughput table based on 3GPP specifications to be used in calculating the throughput for the link. Figure 2: Communication system properties window for calculating throughput for a MIMO system. The user-defined precoding table is a text file containing antenna element weightings for the transmitting MIMO antenna. Each record in the file represents a beam that the antenna elements are capable of producing. This example uses a table that describes 66 antenna beams that allow the transmitter to scan horizontally from -50 to 50 degrees and vertically from -10 to +40 degrees in 10 degree increments, by varying the phase of each antenna element. Base stations will select the antenna beam that maximizes the power at the receiver for each position of the UE. The throughput for the 5G NR device at the receiver also uses a custom file, mapping SINR at the device to an achievable downlink data rate. Throughput values for this table were calculated using the equation published in 3GPP TS 38.306 v15.2, which calculates data rates for 5G NR for each potential modulation and coding scheme (MCS) and takes into account overhead for signaling and control and differences between uplink and downlink transmission  . Estimates were for a single component carrier with a 100 MHz bandwidth and assumed similar relationships between the achievable MCS and the SINR as has been observed for LTE. Three communication systems were created to analyze the effects of selection combining, equal gain combining, and maximal ratio combining for the 5G NR user equipment (UE). Results in Figures 3 and 4 show that in this scenario and configuration, there is not a substantive difference between the three diversity methods for SINR or throughput. The remainder of this example will use selection combining for the UE and custom beamforming at the base stations. Figure 3: SINR comparison of receiver diversity methods for base station 1. Figure 4: Throughput comparison of receiver diversity methods for base station 1. SINR and throughput results are provided for each individual base station and for all three base stations working together. In this example, the 5G NR will establish a link with the base station that provides the highest SINR value. The red line in Figures 5 and 6 represents the overall performance of the three base stations to the UE, according to the base station that achieves the highest SINR at each point along the route. The blue line represents the contribution of base station 1 to the SINR and throughput. In regions where the blue and red lines overlap, the receiver establishes a link with base station 1. Contributions from the other two base stations are also plottable but were omitted for clarity of the graphs. Figure 5: Total SINR (red) and SINR from Base Station 1 to UE (blue). Figure 6: Total throughput (red) and throughput from Base Station 1 to UE (blue). Maximum Ratio Transmission beamforming calculates an optimal beam to each receiver location. In Figures 7 and 8, the SINR and throughput results using a custom beamforming table (blue) are compared against MRT (red). In most locations the predefined beams from the custom beamforming table are able to achieve nearly the same SINR and throughput as MRT (a more optimal, adaptive technique), but there are sections where adding more targeted beams would improve the results. Between 225 and 350 m along the route, the SINR values are too low to allow adequate throughput values with both beamforming methods. To improve coverage in this location, it would be necessary to add an additional base station. Figure 7: Comparison of SINR for custom (blue) and MRT (red) beamforming. 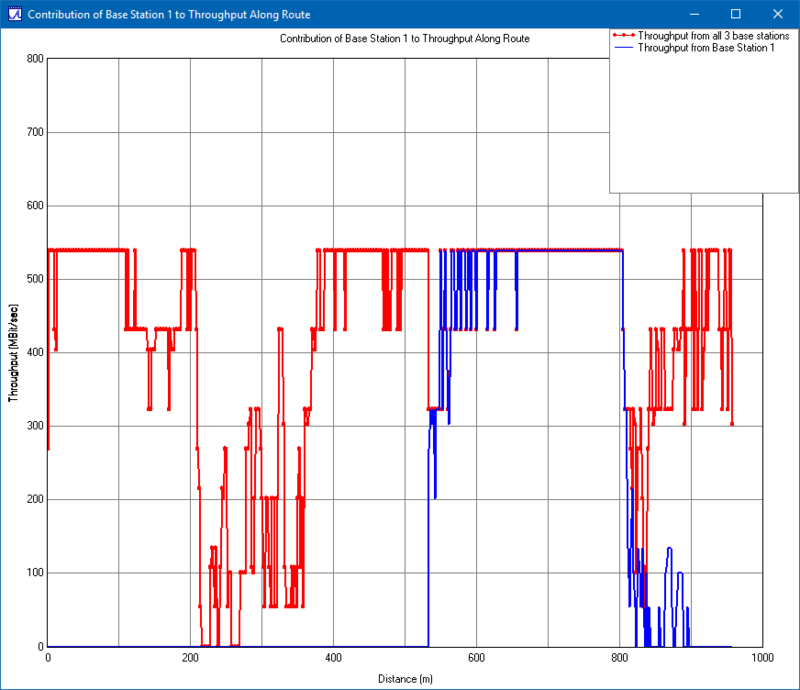 Figure 8: Comparison of throughput along the UE route from all three base stations for MRT (red) and custom beamforming (blue). Figure 9: SINR coverage for custom beamforming and selection combining. Figure 10: Throughput coverage for custom beamforming and selection combining. Wireless InSite’s Communication Systems Analyzer can be used to calculate throughput, SINR and other system level quantities for realistic MIMO systems, including both transmit beamforming and receiver diversity. This example demonstrates how a custom beamforming table can be used to model the dynamic behavior of three MIMO base stations in a section of Boston. A custom throughput table was used to model downlink data rates for 5G New Radio. Wireless InSite’s X3D high fidelity ray tracing and MIMO capabilities allowed for efficient calculation of SINR and throughput. This example also demonstrates how built-in theoretical beamforming and receiver diversity options allow quick comparison of the throughput coverage provided by custom techniques. Remcom’s Communication Systems Analyzer provides network planners and equipment designers with the tools needed to evaluate base station location and estimate the throughput in realistic scenarios. With the ability to incorporate custom beamforming and throughput rates, users have the flexibility to design and assess new equipment and network configurations. "Electrical characteristics of the surface of the earth," Recommendation ITU-R P.527-3, 1992. "Effects of building materials and structures on radiowave propagation above about 100 MHz," Recommendation ITU-R P.2040-1, pp. 22–23, July 2015. 3GPP TS 38.306 V15.2.0  for 5G NR was used to calculate peak throughput based on the modulation order and coding rate. G. Skidmore, "Using Modeling and Simulation to Assess Challenges and Solutions for 5G Fixed Wireless Access."